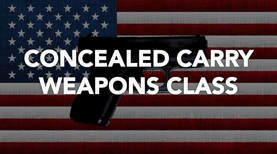 ​This class is taught by a state certified concealed weapons instructor. Those who complete the class will qualify for a concealed weapons permit. Participants must bring a valid Utah Driver License. Those without a Utah Driver License must bring a concealed carry permit from their previous state.